The Queen's relationship to Papua New Guinea is unique. In all her duties relating to Papua New Guinea , she speaks and acts as its Queen, and not as Queen of the United Kingdom. For day-to-day issues, she is represented by a Governor-General who carries out the duties of Head of State. Though she does not get involved in Government matters, Her Majesty continues to play an important symbolic role. Unlike other Commonwealth realms (countries where The Queen is Head of State), the Governor-General of Papua New Guinea is nominated by the country's Parliament, rather than by its Prime Minister. Papua New Guinea has had a steady stream of Royal visitors during The Queen's reign. The Duke of York officially opened the 2015 Pacific Games in Papua New Guinea on behalf of Her Majesty, as well as visiting Commonwealth war graves in the country. Mi bringim bikpela tok hamamas bilong mejesti kwin Papua Niugini na olgeta haus lain bilong mi lon dispela taim bilong Diamon Jubili misis kwin. Mi tokpisin olrite? I bring you greetings from Her Majesty the Queen of Papua New Guinea and from all my family members during this celebration of the Diamond Jubilee of the Queen. Was my Pisin correct? His Royal Highness had also visited in 1984 when he opened the new Parliament House, and in 1975 when the country celebrated its independence. 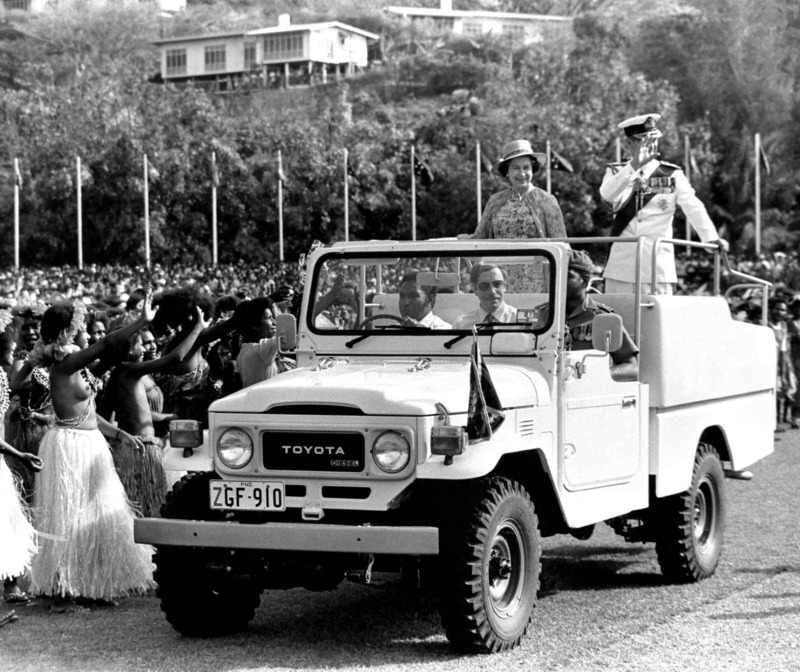 The Queen, The Duke of Edinburgh and The Princess Royal visited in 1974, and Her Majesty and His Royal Highness returned for the Silver Jubilee in 1977, arriving in the capital Port Moresby, and later visiting Pompondetta and Alotau. They returned again in 1982. The Duke of Edinburgh visited the country early in The Queen's reign, during an extended Commonwealth tour in 1956/7. In 2014 The Queen Elizabeth Diamond Jubilee Trust launched a search for exceptional young people across the Commonwealth who are passionate about working with their communities to effect change. The winners receive a unique package of training and mentoring which will help them continue their excellent work in their home country. The first Queen's Young Leaders were announced in 2015, and included John Taka from Papua New Guinea who set up 'Seeds of Hope' to help his rural community build new roads and start a potato-selling project to help pay for students’ school fees. John is also President of Spark PNG, which supports founders of social start-ups. John will receive ongoing support from the Trust to help him and his community.